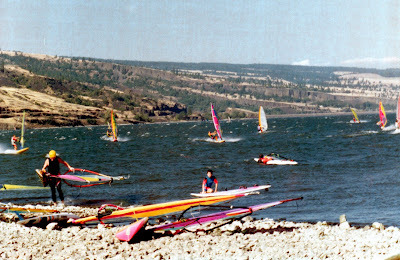 For anyone that is a windsurfer the Colombia River Gorge is a required pilgrimage. 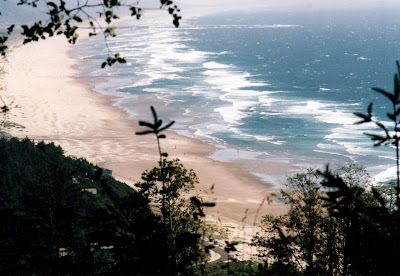 The river separates Washington and Oregon emptying into the Pacific Ocean just west of Portland Oregon. 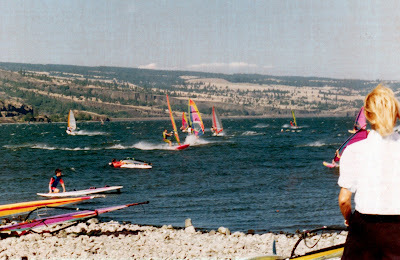 To wind surfers its just called “The Gorge”. It is indeed a gorge. The Colombia river running out of the high plains to the east has eroded a deep gorge between mountain peaks as it wanders its way to the ocean. Weather conditions on the coast in the months of June, July, and August are daily high pressure systems, and the weather inland on the high plains are hot dry low pressure systems. This creates strong winds traveling east up the river. Combine that with a 5 mile and hour current flowing west as the water flows downhill and you get some incredible waves and windsurfing condition. There are a few locations where the river narrows to a few hundred yard across between high mountain cliffs on each side that act like a funnel creating extremely high winds and waves. That is of course where thousands of people go to sail. 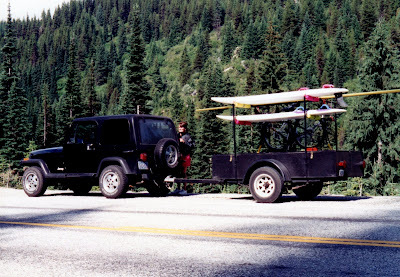 I have flown out to the Gorge on a surfing trip the previous summer but this summer we were planning a road trip. 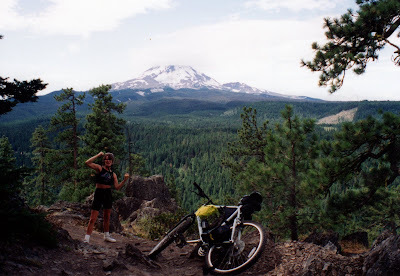 The trip would of course include plenty of windsurfing, but also biking, camping, and hiking in the Hood River area as well as the Pacific Ocean. 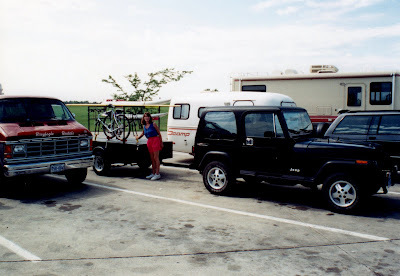 The trip would last two weeks and we were taking our jeep and pulling our windsurfing trailer with our bikes and camping gear. 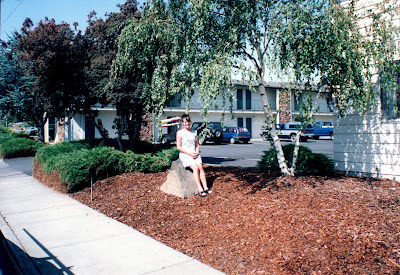 Here’s Margaret at a rest stop on Interstate 90 somewhere in the Great Plains heading west towards the Pacific Ocean. Its a 3 day drive and almost 2000 miles from where we were living. 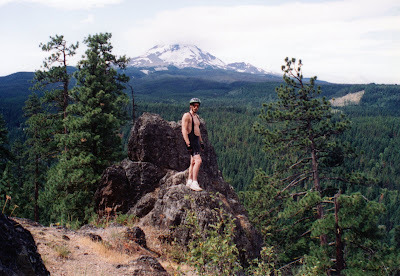 Our plan was to camp at different places on the way out to the Gorge and a few days while we were there, but some of time while in Hood River we planned on staying at a hotel that had a hot tub to sooth aching muscles after windsurfing on the river. 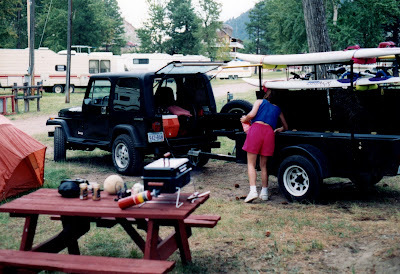 Here we are parked at a campground near Missoula Montana about to grill supper after a days driving. The scenery in the Rocky Mountains is fantastic requiring a stop along the road for pictures and a break. Somewhere in Idaho on the Lewis and Clark trail we stopped for lunch along a beautiful little river flowing next to the road where there was a gravel pull out. 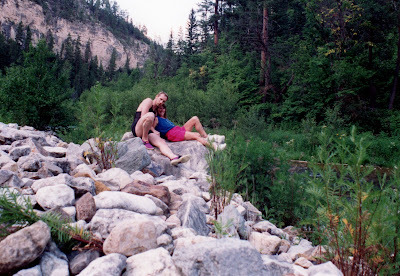 We packed our lunch and went down by the river and discovered one of those places that you remember for the rest of your life. There was no one else anywhere around, but the trusty timer on our camera at the time recorded a few images for us. We arrived at the east end of the Columbia River later in the day and decided to camp at an Army Corp of Engineers campground along the river. We set up the tent in a spot right next to the river had dinner and a beer and went to sleep in out tent. Later in the evening we were awaken by a horrible noise and the tent shaking violently. At first we thought someone was out there shaking the tent, but quickly it became obvious that the wind was blowing very hard causing all the noise and shaking. We got dressed and went out to see what had happened. Checking out the campground all the tents in the park were blown down. It appeared that there had been a brief violent downdraft of wind that had knocked all the tents over except ours. The next day we moved on down the river to a hotel near Hood River where we stayed for several days using it as a base camp to surf, bike and hike out of. They has a nice pool, hot tub and a comfortable room to return to after a full day of play. Daily when the wind was blowing we hit the river and sailed. There was always plenty of people on the beach to watch and great sailing. One of the reasons the sailing at the Gorge is so great certainly is the steady wind, but because the current flows against the wind you never lose ground on a high speed run across the river. 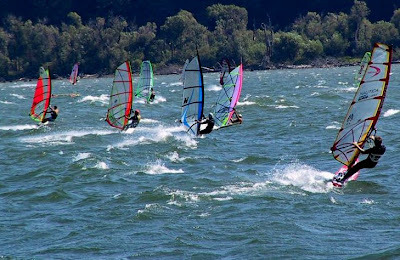 This is unlike normal sailing on a lake where you are forced to tack back into the wind at slower speeds to not lose ground. 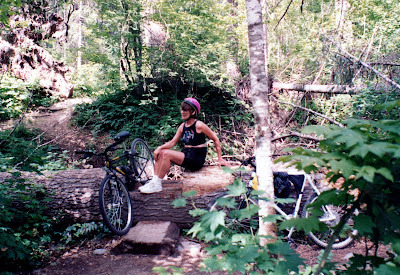 On one of the days when the wind was not blowing so hard we took our bikes out onto one of the many biking trails in the mountains south of Hood River near Mount Hood. 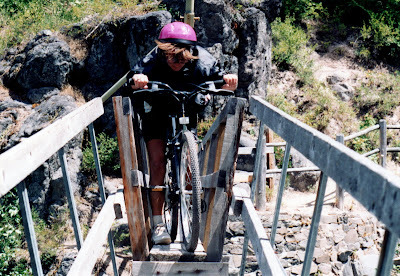 The bike trail turned out to be more pushing and carrying than riding, but it made for an exciting time and a good day. Nearing the end of out time in Hood river we took a day and traveled to the Pacific coast along Highway 1. Our intent was to sail on the ocean for a day, but the wind wasn’t cooperating. While I never got to sail the Pacific the views and coast were outstanding. We settled for lunch and a picnic along the beach before working our way back to Hood river. The Gorge trip was one of the few long cross country driving trips we have ever taken due to our time spent at the lake. As life leads us onward I think that we will see that change.